In the 1920’s investors platted new housing developments on the bluff south of Saint Clair Avenue near Linwood Park. 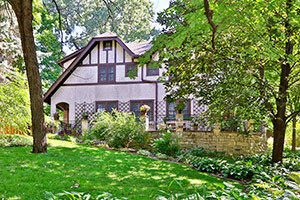 This picturesque Medieval style cottage on Benhill Road home was the long-time residence of an executive with the First National Bank of St. Paul. A later addition expanded the kitchen, created a sunroom, and an expansive deck to the park-like hillside. The homeowners are collectors of Asian textiles and artwork which are displayed throughout the home. 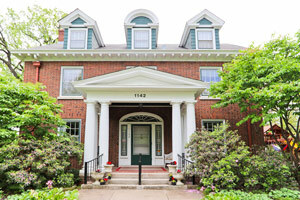 Kris and Gene Ranieri have made the storybook home at the corner of Oxford & Goodrich their residence for nearly 30 years. It is a comfortable gathering space for the whole family, a place where their kids and friends to grow up, and as they say, “lots of shenanigans.” The front face of the home, replete with window boxes made by a local carpenter on both stories spans the width of Oxford Street. The couple has created a beautiful garden encircling their entire lot and on the boulevard. The home’s rectilinear body, clean lines, symmetry and side gabled roofline embody the spirit of the Colonial Revival style. Its wide eaves, rafter tails and oversized porch roof brackets evokea strong Craftsman-style sensibility, and once inside the Arts & Crafts fireplace, interior woodwork and built-ins take center stage. A highlight of the home is Pilot Boat 456 in the basement of the home, made for the Children’s Museum at Bandana Square in 1985. The couple were actively involved in the museum’s growth, and when the museum moved to downtown St. Paul in the early 1990s, the ship came home for their children and grand-children to enjoy. Philip C.Justus, commissioned the home to be built, and it was likely designed by his son Elmer who apprenticed with architect Clarence H. Johnston. Interestingly, the home is the twin to Justus’s own 1910 residence at the corner of Dunlap and Portland, a block from Summit Avenue. Justus owned a major hardware store in 1900’s St. Paul and was elected Ramsey County Sheriff 1901-1904. From 1908-1930s Justus developed homes throughout the Summit Hill neighborhood. The first owner of the home was Oscar Oftelie, president of a real estate firm who lived in the residence until 1939, and likely built the quaint garage, with an artist’s loft added by a later owner. The home is known in the neighborhood as the “Starr House,” after Donald Starr and his family. Mr. Starr was a Manager of the Midway Montgomery Wards store for 40 years, while living in the home, and the Starr legacy is the stone fireplace and grille in the backyard, which the Ranieri’s used during the winter as an outdoor warming house for the skating rink they built each winter. Among the most historically significant and splendid homes in Minnesota, the Burbank-Livingston-Griggs Mansion reflects the legacy and love of its many stewards. In 1862, Summit Avenue was a dusty country road on the bluff above the Mississippi when stagecoach and steamboat mogul James C. Burbank built one of the finest examples of Italianate architecture. In 1882, architect Clarence H. Johnston created a monumental Stair Hall, with patterned and mosaic hardwood inlays carved with Romanesque and Renaissance motifs --one of the most exquisitely sculpted and assembled home entrances in Minnesota. Mary Livingston Griggs inherited the home in 1925 and worked with architect Allen H. Stem to create an English Renaissance “Stone Room” overlooking the garden, and with architects Edwin Lundie and Magnus Jemne to import antique European wall coverings and artwork to adorn the elegant central rooms. One of the oldest homes on Summit Avenue will be featured on the 2018 tour, a brick Victorian Queen Anne mansion, the first of the “new style” built on the Avenue. Coming into vogue in the 1880‘s, the “Queen Anne” style has an asymmetrical facade, dominant front-facing gable, and distinctive tower among many other characteristics. Original elements of the home have been meticulously preserved, including the exquisite carved foyer and staircase, fireplaces, leaded glass windows, and inlaid wood floors. The architect is unknown, though likely Augustus Gauger, a German architect who designed stately homes in St. Paul during 1878-1920, and built the second home for the original owner, known for building the first cold storage warehouse in St. Paul, and manufacturing carriages and farm implements. The young family restoring a home on Holly Avenue discovered one of the most unique and unusual examples of recycled building materials. Beneath many layers of shingles, hand-painted advertising signs from the 1870’s were used as pine underlayment. The family preserved many pieces of this original artwork on the walls of their new home. While preserving as much of the original structure and artifacts as possible, including one of the basement limestone walls as an architectural element, a seamless addition to the home creates an open floor plan featuring a new kitchen and open staircase to the second floor with both original bedrooms and a new master bedroom and bath. Built during St. Paul’s first Building Boom, the partnership of William Willcox, a nationally known architect who arrived in St. Paul in 1882, and the rising young architect Clarence H. Johnston, designed Summit Terrace as eight residential” New York” style row house units each with a distinctive facade. The family of author F. Scott Fitzgerald lived in several of the row houses in Summit Terrace, and in 1919 Fitzgerald finished "This Side of Paradise," his first novel to be published. The author wrote of his happiness and recalled stopping automobiles on Summit Avenue to tell his friends about his new world of “top loftiness and promise.” The row house where Fitzgerald completed his first published novel is a National Historic Landmark. A home on the first Summit Hill House Tour in 1978 will be open once again. Owned by an architect and family who were active in the non-profit organization Old Town Restorations, Inc., which led community efforts in the early 1970’a to bring families back to the inner-city and keep the Historic Hill District Neighborhood and history alive. In 1978, the home was introduced as “Oak & Marble” for the oak woodwork, furniture and the marble-topped dining table and kitchen counters. The owners have made several additions and modifications for their family of three children and now four grandchildren including south facing porch off the kitchen which spans the home and overlooks the deep back yard. The porch addition permitted space for a walk out lower level apartment. Originally built by a trio of sisters who were well-known public school teachers, the home was moved in 1958 to its current location from Holly Avenue by Unity Church for their expanded education wing. Designed by Clarence H. Johnston as one of his last towered houses, this bold yellow-brick home represents an amalgam of popular architectural styles in 1900 including Queen Anne, Colonial Revival and hints of medieval Gothic-style. The original owner was a prominent businessman and agent for Armour & Co. of Chicago who was illegally arrested for violating a new law in Minnesota which prohibited the sale of oleomargarine. The David Heide Design Studio has restored and expanded the home with sparkling new conveniences. A lovingly preserved Crocus Hill home in the Queen Anne style with a classical front porch added in the 1900‘s. Built by an attorney in private practice who immigrated from Norway, the home was constructed by architect Charles Engelbrecht in the new suburb of Summit Park after St. Paul’s first electric street car opened on Grand Avenue in 1890. The grand foyer opens to a cozy living room with a carved poem below the mantel. The gracious home features period interior design with modern amenities. Builder, architect and Progressive Era activist C.J. Buell designed this classic Foursquare home for a family returning to St. Paul after living in Manhattan. American Foursquares were built in Midwestern urban neighborhoods, particularly where streetcars were plentiful, such as the Historic Hill District. The home has elements of both the Prairie School and Craftsman style. The home features thoughtful and creative re-design of interior spaces by the David Heide Design Studio, including a small addition to create a large kitchen unusual for a Foursquare, with millwork and cabinetry that match historic elements of the home. A new rear entry connects the kitchen to a family room for modern living. Architect Allen Stem, known for designing the University Club and Grand Central Station, designed this “Tuxedo New York” stone home on Grand Hill for a descendent of the Schuneman family. The Schuneman and Evans Department Store operated at Sixth and Wabasha from 1888 until its merger with Dayton’s in 1958. The home was also the long-time residence of a celebrated voice teacher and served as a training retreat for many legendary opera singers. The exquisite living room with stone fireplace has been the perfect setting for classical concerts through the years. The home was recently carefully restored and shines with the patina of 100 years, with 21st Century technology. Summit Avenue near Lexington was the end of the paved street in 1900 when Minnesota architect P.J. Linhoff designed this home for a family operating a confectionery business in both Minneapolis and St. Paul. The family clearly loved the design and built an identical home in Minneapolis, and sold the brand-new home to a single woman, the daughter of a former Congressman. At Midcentury, a 3M Executive was steward of the home for decades and bequeathed it to his daughter, who created an expansive addition for her large family. The addition is a time capsule of high fashion 1960’s design. The current owners are a growing family who are restoring the historic home top-down, beginning with a newly completed third floor “writer’s suite” for their Aunt, an author. The classic grand entry opens to the original dining room and expansive living room where the family hosts DJ led monthly neighborhood dance parties. St. Paul’s Church-on-the Hill, a historic Episcopal church in the English Gothic Revival style, will be open to the public once again. The Summit Avenue church near Snelling Avenue closed recently after a dwindling and aging congregation determined members were not enough to continue as a house of worship. Founded in 1854 with Minnesota’s first Governor Henry Sibley as a member, the original St. Paul’s Church was built in 1857 in Lowertown. The site is now CHS Field, the new Saints ballpark. Commonwealth Properties recently purchased the century-old Church on the Hill from the Episcopal Church of Minnesota with plans turn the sanctuary into a performance space, with seating for about 300, and convert the church's Sunday school building into a base for the music school. St. Paul resident John Rupp, through his company Commonwealth Properties, specializes in preserving iconic buildings in St. Paul for modern uses including the St. Paul Athletic Club, the University Club, W.A. Frost & Co., The Commodore Bar and Restaurant, and many others. Many magnificent elements of the Church will remain, including a statue of St. Paul, holding a “sword of the Spirit” and one of his lengthy epistles, set in a niche in the church tower. John Wright, a priest and the rector of the church at the time of its construction, died in 1919, and lies in a crypt under the sanctuary. To hold the first service on Christmas day in 1913, the congregation relocated to the up-and-coming “Hill” area of St. Paul and the old stone church was dismantled, and the limestone, tower spire, pews, altar and stained-glass windows were hauled up to Summit Avenue by ox cart. Emmanuel Masqueray, a French immigrant to Minnesota who was trained at the Ecole Des Beaux Arts, was chosen as the architect for the new Church. Masquery’s Church-on-the-Hill is a “quietly elegant church,” with a 9,000-square-foot sanctuary, a 60-foot cathedral ceiling and a large rose window above the entrance. The sanctuary is the perfect site for a music venue is renowned for amplifying and carrying a warm, round sound. Masqueray was the chief designer of buildings at the 1904 St. Louis World’s Fair and was chosen by Archbishop John Ireland to come to St. Paul to design the Cathedral of St. Paul in 1904, and the Basilica of St. Mary in Minneapolis in 1908. Masquery became a leading designer of parish churches throughout the Midwest chiefly due to his friendship with the Archbishop. Masquery died unexpectedly in 1917 at age 54 leaving several commissions unfinished and was sadly not able to finish construction of St. Paul’s Cathedral during the 1930’s. Prominent St. Paul architects who were Masquery’s chief assistants became his business successors, including Edwin Lundie, Frank Abrahamson, and Fred Slifer and finished the ten commissions he left unfinished. Thank you to John and Stephanie Rupp with Commonwealth Properties for donating the use of this space to host this year’s volunteer after-party! A symbol of success, personal taste, and family life, the James J. Hill House recalls the powerful era of the Northwest’s “Empire Builder.” The Boston firm of Peabody, Stearns, and Furber, known for impressive mansions in Newport, Rhode Island, designed a massive Richardsonian Romanesque style mansion, then very much in fashion. The final cost totaled nearly $1 million in 1891, including construction, furnishings, and landscaping for the three-acre estate. Hill oversaw the planning, construction, and furnishing of the house as if it were a new branch of the railroad. He rejected stained-glass window designs by Tiffany and Company, saying they were "anything but what I want," and even replaced the architects when they ignored his orders to the stonecutters. He instructed his Boston interior design firm Irving and Casson to finish the project. Their work included many custom furniture pieces on the first and second floors. When it was completed, the mansion was the largest and most expensive home in Minnesota. The house is 36,500 square feet on five floors and has 22 fireplaces, cut glass chandeliers, a two-story sky lit art gallery and three-story pipe organ, extensive carved oak and mahogany woodwork, and sophisticated mechanical systems throughout the mansion for central heating, gas and electric lighting, plumbing, ventilation, security, and communication. The two-story art gallery was built for Hill's magnificent art collection, consisting mainly of Barbizon School of mid-19th century landscape painters. Retractable iron grilles on the windows and doors provided security for the collection and the family's other valuable possessions. Much of the art collection was later given to the Minneapolis Institute of Art, which Hill helped found in 1915. The home served as the center for the public and private lives of the Hill family for the next 30 years. Children grew up in the house, and four daughters had their weddings in the large drawing room. Newlyweds often lived in the enormous house until their own homes were completed, five of which were close by on Summit Avenue. In later years the house came alive with visits by grandchildren. Mrs. Hill maintained the house after her husband’s death in 1916 until her own death five years later. 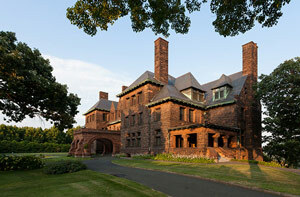 In 1925, family members purchased the mansion from the estate and presented it to the Catholic Archdiocese of St. Paul. For the next half-century, the structure served as an office building, school, and residence for the church. The Minnesota Historical Society acquired the house in 1978. It was recognized as a National Historic Landmark in 1961. Saint Thomas More Catholic Church, founded in 2008, is the union of two Catholic parishes: the Church of Saint Luke (1888) and the Church of the Immaculate Heart of Mary (1949). Construction on the current church took place between 1924 and 1926, and the church was dedicated in October 1926. John Theodore Comès, one of America’s most famous architects, designed Saint Thomas More Catholic Church. Comès, a native of Saint Paul, headed the firm of Comès, Perry and McMullen of Pittsburgh and was invited by Archbishop John Ireland to design and oversee the construction of this church building. When Comès died suddenly in 1922, his associate William Perry brought the project to completion. 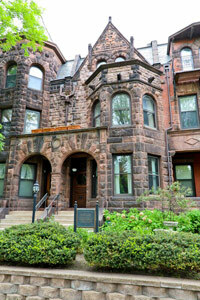 Under the direction of the Walter Butler Co. Inc. of Saint Paul, construction began in 1924 and was completed in 1926. The main features are the basilica floor plan, soaring barrel vault ceilings, the soaring apse at one end of the building, and the apsidal chapels around the apse and/or throughout the nave. Saint Thomas More Catholic Church is a notable example of “Romanesque Revival” architecture, which thrived throughout Europe and North America from 1888 to 1930. Romanesque Architecture is a combination of the architectural styles of the Roman and Byzantine empires and flourished throughout Europe and England between the 9th and 12th centuries. The church is constructed of Indiana Bedford Limestone and measures 198 ft. in length. A glorified cross surmounts the imposing 122 ft. façade on Summit Avenue. Below the cross is the Paschal Lamb and a statue of Saint Luke, the original patron. The great rose window with the symbols of the four evangelists stands at the center of the facade. Saint Thomas More is the Jesuit parish of the Twin Cities, a community where all are welcome. In 2017, St. Thomas More became the second Jesuit parish in the nation to declare itself a sanctuary parish, following another in San Francisco. It the first Catholic parish in the Archdiocese of St. Paul and Minneapolis to declare itself a sanctuary parish; it is the second Catholic church in Minnesota. Saint Thomas More provides a comfortable and safe apartment to those threatened by deportation and offers companionship, food, clothing and connection to additional resources such as legal aid as each family may need. Saint Thomas More Church is a ticket pickup location for the tour. Dixie’s on Grand is a locally owned venue that has been sharing the Southern tradition of serving authentic comfort food with warm and gracious hospitality to the Twin Cities since 1988. Recipes from Cajun country designed by a Louisiana native have been handed down through generations. Classic fried chicken and po’ boys have been Dixie’s menu favorites for 30 years. The buildings housing Dixie’s and its sister venues, Emmett’s Public House and Saji-Ya, were originally built in 1971 as grocery stores – Piggly Wiggly first, then Schiller’s from 1973-1977. In 1981, as Grand Avenue’s Renaissance began, Esteban’s Mexican Bar and Café opened in existing structure of the former stores. Prior to 1971, the large lot at the corner of Grand Avenue & St. Albans had been vacant for decades. Its early use is unknown but may have been part of the grounds of a large estate on Summit Avenue. During the 1880’s-1890’s St. Paul’s population tripled, and Grand Avenue served as the backbone of western suburban expansion. The avenue was traditionally a street of small business, and by the 1960’s, competition from shopping centers and the decline of neighborhoods in the inner-city led to the departure of many old-line businesses. Buildings on Grand Avenue were considered obsolete. In the early 1970’s and 1980’s, neighborhood activists and entrepreneurs revitalized the avenue with new businesses in the buildings from the bygone era. The first Grand Old Day parade and street fair in 1973 promoted Grand Avenue as a compliment to the historic neighborhoods nearby. Today’s Grand Avenue in the big city still has the small town feel of the diverse businesses like its original use in the Hill District. A special thanks to Dixie’s for hosting brunch for our VIP ticket holders! Opening in 1935 at the end of Prohibition at the corner of Grand Avenue and Lexington Parkway, The Lexington became the place where St. Paul’s elite living blocks away celebrated milestone family events. The electric trolley on Grand Avenue also brought visitors from throughout the Twin Cities. Previously operating as a speakeasy, the expansive interior wood panels were perfect for hiding a little booze, and let your imagination decide the purpose for the hidden staircase behind the coat check. “The Lex” was the place to be seen; business dealings, cocktail hours, and milestone celebrations were a regular occurrence for St. Paul socialites. The nostalgic feeling of a passed era is renewed. The iconic exterior façade remains the same, but the interior is completely restored -- carved wood paneling surrounds seating for 100 diners, original artwork from the late 1800’s and early 1900’s shine with patina, and the bronze chandeliers have new crystals and lighting. The Williamsburg Room, a lounge with full bar, seats another 100 guests and features a Grand Piano and fireplace. A second-floor private event space has room for 120 people, and a new rooftop bar with a tiki-touch opened this summer. 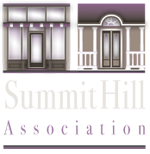 The Lexington will have complimentary snacks, a cash bar, and restrooms available for tour guests. Completed in 1913 at an estimated cost of $100,000, The University Club of St. Paul was modeled after great turn-of-the-century clubs in London, England. Allen H. Stem, a prominent architect, designed the building. Stem and his partner Charles A. Reed were nationally known architects of major railroad buildings, including Grand Central Station in New York City. The team also designed the The St. Paul Hotel, a local landmark. The University Club is a member of an association of reciprocal clubs located throughout the United States and the world. Most University Clubs were chartered in the late 19th century and patterned after the Oxford and Cambridge Club in London which was established in 1821. The name “University Club” comes from the requirement that members be either college students or graduates. Presently, to be a member of the club, the applicant must be a graduate of an accredited college or university. The University Club today serves many residents as a venue for socializing, exercising, and for special events. The Club crowns the top of Summit Hill, commanding a panoramic view of the Mississippi River Valley. The design of the building is English Colonial, although some of its rooms are more reflective of the English Renaissance. The facade features an intersecting gable roof trimmed with an ornate border and six gabled dormers. Perched on a limestone base, the first story is constructed of brick, and the upper stories are faced with stucco, while the entry doors are recessed within a stone Tudor arch. The Fireside Room, on the left of the lobby, originally served as the "lounging room," designed to reflect the ambiance and even some of the detail of countless lounges in gentlemen's clubs in England. The Summit Room, to the right of the lobby, was the Club's original Dining Room. Both the paneling and the ceiling are original. Minuti and Brioschi, a local firm, designed the spectacular plaster ceiling for the Club, for the lobby of the St. Paul Athletic Club, and the Walter Library, University of Minnesota. The University Club staff will provide tours of this historic building. Complimentary ice water, cash bar, and restrooms will be available for tour guests.